Sometimes a good deal deserves an encore. Nvidia's SHIELD TV is a popular set-top Android device, providing you with all the apps you love on a big screen, as well as some decent gaming chops. 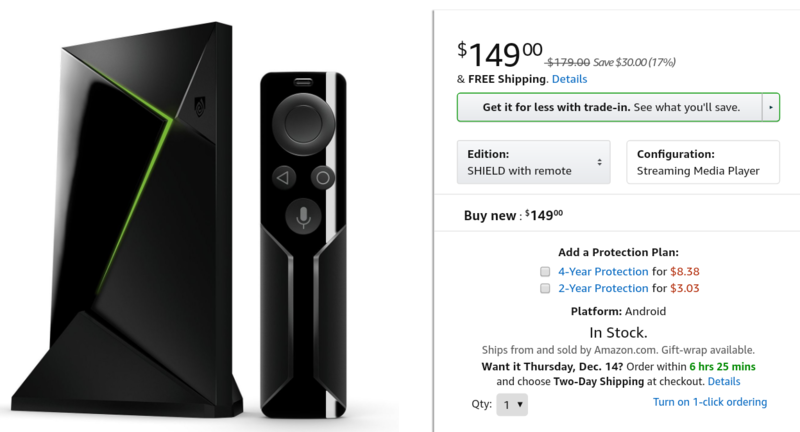 Back during the Black Friday sales it dropped down to $149, or $30 off the full price. But just in case you missed it, the deal is back. Of course, if you haven't been sold just yet on the idea of an Android device for your TV, feel free to peruse our review at your leisure. It even has 4K HDR support. Who knows, you might just be convinced. Don't forget to redeem your three months of YouTube Red, too. At least, if you are a new subscriber. Unfortunately, although we originally thought this was a separate promo, this is the same 3 month promotion Google runs for new subscribers, so it doesn't stack with whatever subscription you may already have, and not everyone will qualify for it. Turns out the YouTube Red offer isn't a separate promotion, it's the same three month deal Google offers for new subscribers, so don't base your purchase purely off it. The article has been updated to reflect that.